Gloria Pierre started her company, Clearly Speaking, in 2000 after a workplace incident revealed she was inept at handling situations assertively. Through research and interviews, she discovered communication is the one skill everyone uses regardless of their status, education or experience and that your success hinges on how well you are able to communicate. 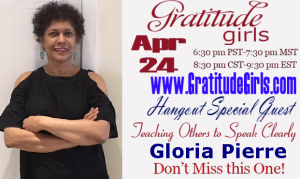 Gloria has been training and coaching speakers, presenters, executives, entrepreneurs and native and non-native English speakers to communicate their ideas effectively and respectfully. She has coached people who presented at the White House in Washington, spoke at Air Canada Centre and presented at the UN. She has spoken at conferences in the Canada, US, The West Indies and South America and at events in Canada. She has three signature talks – Drop Your Bucket Right Where You Are, No Way Out For Adwa and Man Without Smiling Face Should Not Open Shop. She wrote six books, (K)New Words, ABC’s Of Networking, ABC For Speakers & Presenters, ABC For The Workplace, An English Guide to Pronunciation and Mispronounced & Misunderstood. She has appeared on Breakfast Television, Global TV, Omni TV and New Canadians TV and was profiled in Metro newspaper, radio, The Star Business Club and quoted in Cosmopolitan Magazine. Gloria is doing what she is passionate about and intends to change your awareness of communication as a personal marketing tool. Gloria is absolutely right about the value of communication! She is providing a much-needed service and with passion and joy! Gloria is doing a wonderful job and I admire the work she is doing.